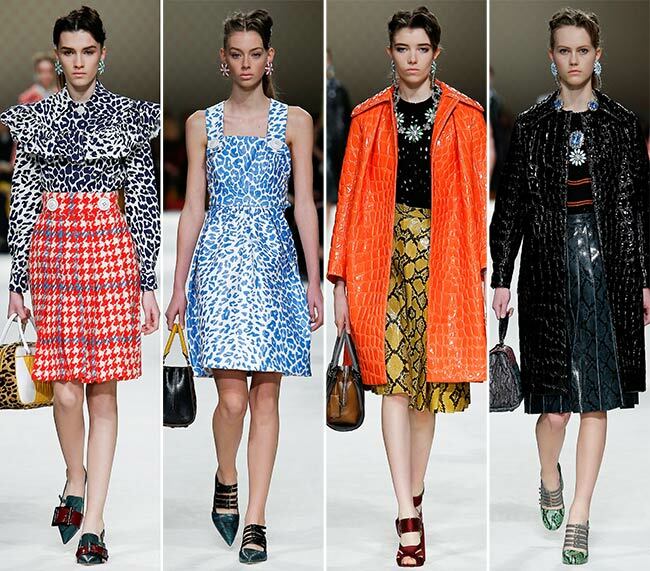 Houndstooth and ruffles, alligator skin and snake-like patterns, funky shoes and big earrings in floral patterns; there is something to be said about Miu Miu, Prada’s secondary line that brings the hip and the young to the fashion world with such grace and gusto. 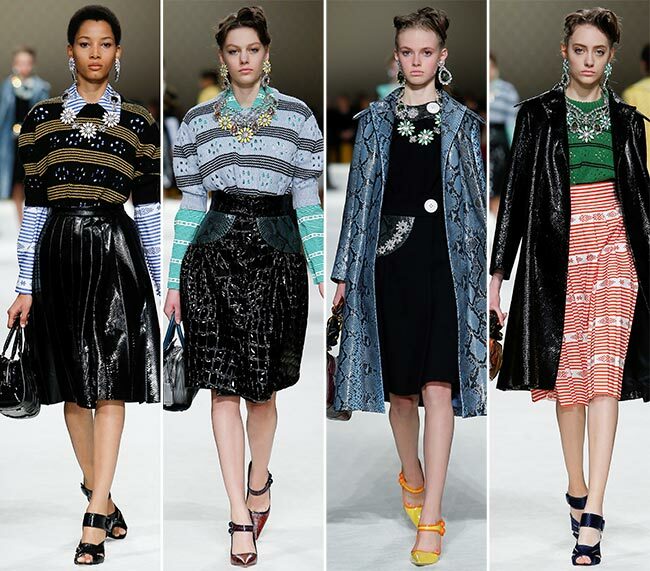 It is an Italian women’s clothing and accessories line, which undoubtedly embodies the passion to stay youthful found in Miuccia Prada’s heart, aptly taken from her nickname. This year we expect to see Miu Miu fragrances as well, a novelty for the label that has stuck to clothing and accessories only since its inception in 1993. 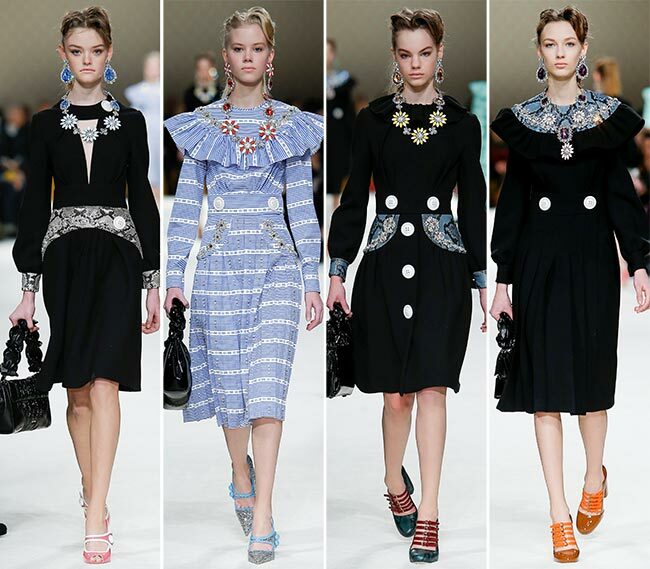 However, at the moment it is the very sight of the pieces from the Miu Miu fall/winter 2015-2016 collection that newly premiered on the Paris Fashion Week runway, as one of the final presentations, that draws us to the brand. 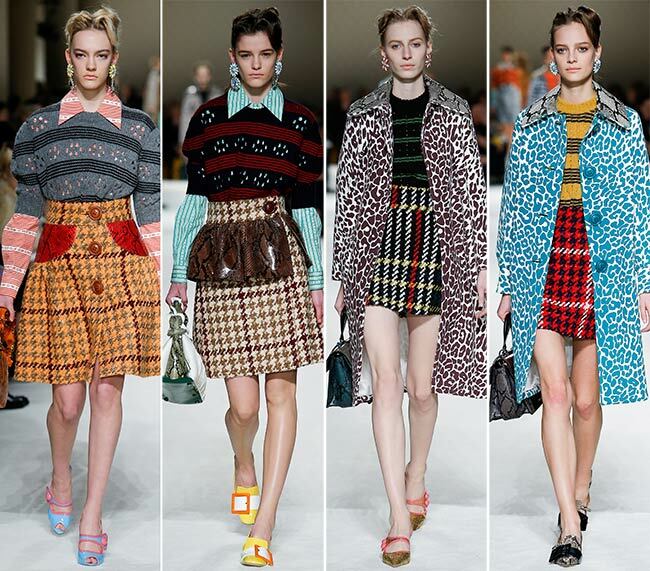 Miuccia Prada has outdone herself in terms of combining Eighties colors and textures, patterns and materials, all in single outfits. 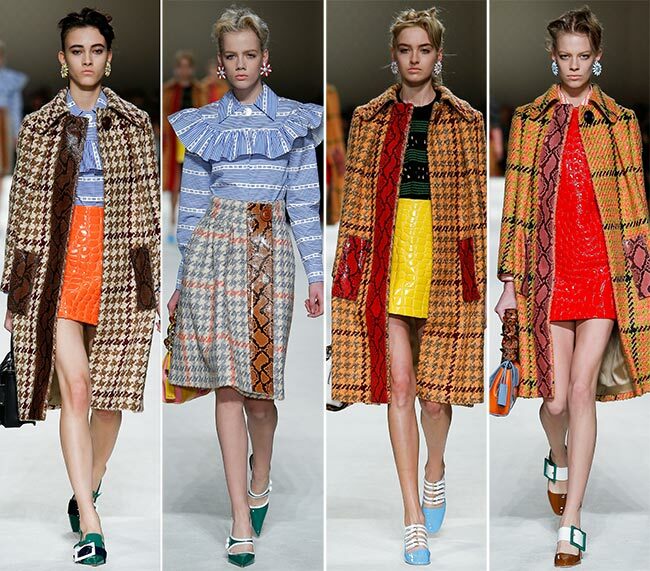 We may have never thrown some of these together, but when the first model struts onto stage in a bright houndstooth knee length coat, lined with brown snakeskin pockets and a strip heading down the length of one side, thrown over a blue and white lapelled louse tucked into an asymmetrical hemmed bright orange alligator skin mini skirt, we have to say that we’re enthralled. Add green shoes with huge buckles and a black leather bag to the mix while styling your hair short and putting on large flower earrings, and you have one of the funkiest mixes ever. The best part is, it does not end there either. 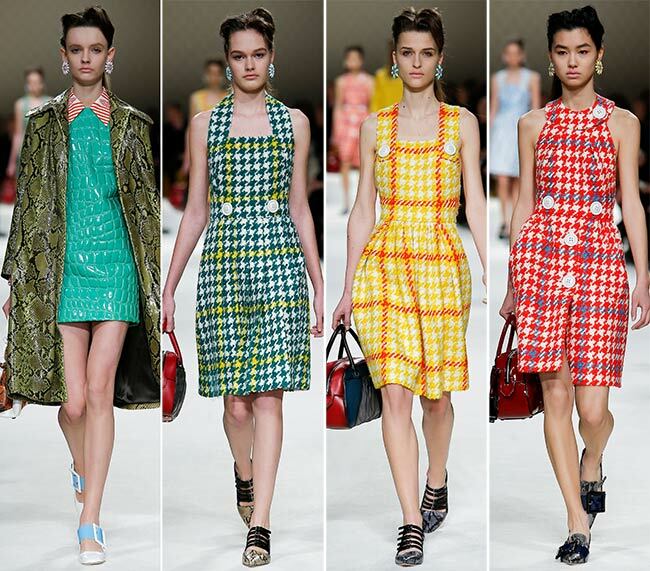 The miniskirts appear in bright sunshine yellow as well, the snakeskin turns also to red, the brown houndstooth is turned into a skirt with snakeskin frills or a more caramel hued background; plus, we experience the beauty of twill! While everything else might look pretty out of this world, we must say that the bright contrast leopard print coat, despite the fact that the skirt underneath is even shorter that a mini, bordering closer to a micro, is like a call back home. 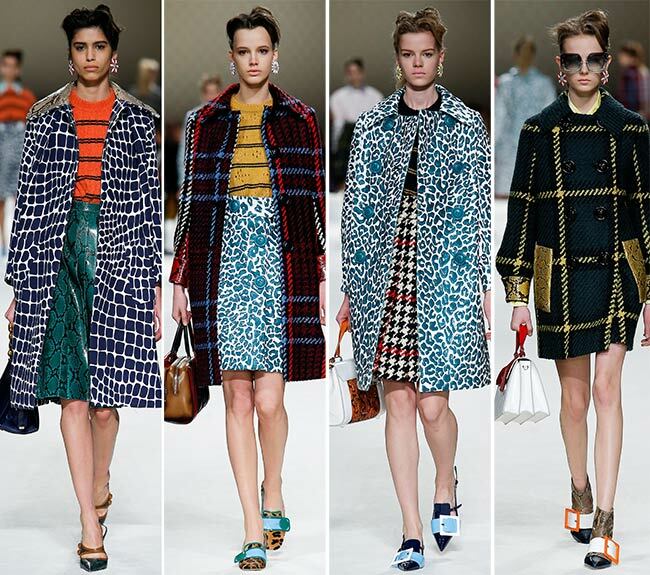 The sky blue versions may begin to hurt the eyes a bit though if you are not expecting it, while the dark blue mosaic patterning has us thinking the bathroom floor was some fine inspiration for we would certainly wear that jacket or that midi skirt with the high waist when we decide to take a walk through town. 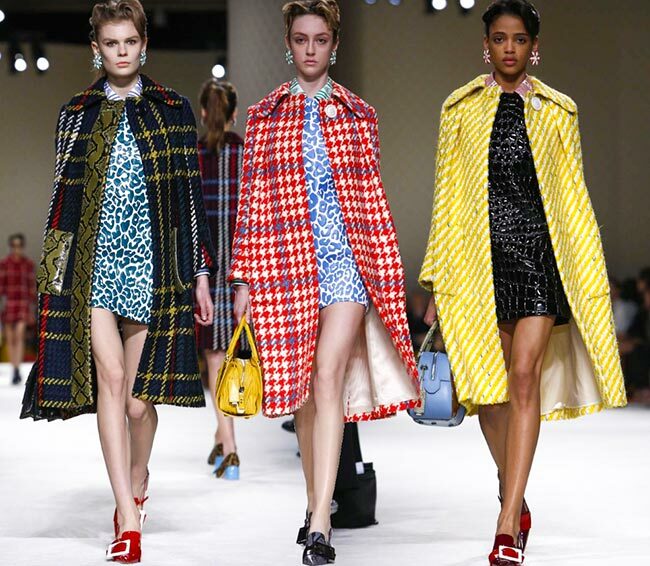 Plus, if you didn’t know that houndstooth can be combined with plaid, you were sorely mistaken for Miuccia Prada doesn’t seem to realize that mixing it all up is making our heads spin. 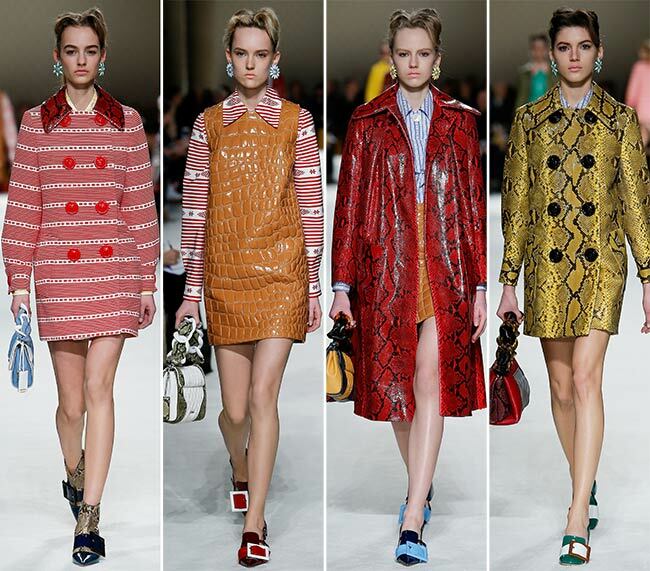 While chic and sophisticated may never be the words used to describe the Miu Miu fall/winter 2015-2016 collection, between the stripes and sports and everything in between, this is probably one of the most appealingly funky collections on any of the runway shows seen around the world, and Miu Miu certainly knows it well. Props are given to defying all the trends and setting her own though. Maybe this is a hint at what’s coming in 2016? Jeremy Scott AW 16 Makeup Tutorial.